When does the release command run? If a release phase task fails, the new release is not deployed, leaving your current release unaffected. When using release phase, there are a number of design considerations to take in to account, especially if performing database migrations. To specify the tasks to run during release phase, define a release process type in your app’s Procfile. If you’re deploying Docker images to Heroku, learn more about using release phase with Container Registry. 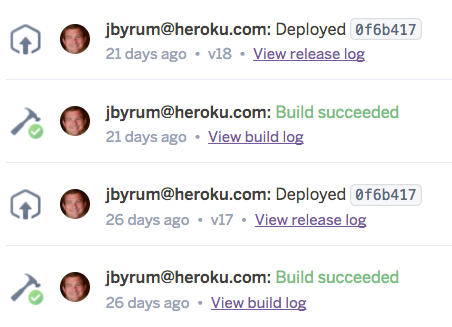 You can use the heroku ps command to see your release command running. You can set the dyno type using heroku ps:type release=<type>. However, you can’t set the type before the first release phase run. If the release command exits with a non-zero exit status, or if it’s shut down by the dyno manager, the release fails. In this case, the release is not deployed to the app’s dyno formation. You will receive an email notification in the event of a release phase failure. If a release is triggered by a change to the value of a config var, the config var value remains changed even if the release command fails. It is possible for a build to succeed and its associated release to fail. This does not clear the build cache. A failed release command usually requires a fix to your app’s code. After making the necessary changes, push the new code to trigger a new release. In some cases, a release failure is unrelated to the app’s code. For example, an external service might be unavailable during release phase. In such occurrences, you can use the releases-retry CLI plugin to retry a failed release without needing to trigger a new build on the app. To check on the status of a release, including failed releases and releases that are pending due to a long-running release command, run heroku releases. Output of the release is available under the output_stream_url attribute and can be retrieved programmatically by making a GET request on the URL. The output is sent via chunked encoding, and the connection is closed when the command completes. If a client connects after data is sent for a given URL, the data is buffered from the start of the command. Output can be streamed while the command is in progress, and at any time after it has completed (in the latter case, all output will be sent immediately). Review apps run the code in any GitHub pull request in a complete, disposable Heroku app. Review apps support a postdeploy script, which is used to run one-time setup tasks. The following timeline illustrates the order of operations and a recommended division of tasks when using both release phase and a postdeploy script for review apps. With each new pull request, review app creation begins. The release command runs again. The postdeploy script does NOT run again. The postdeploy runs only once, on creation of the review app. The recommendations in this section also apply to Deploy to Heroku button apps that use a postdeploy script. Release phase is not suitable for tasks that require filesystem persistence, as filesystem changes during release phase will not be deployed to your app’s dyno formation (the dyno filesystem is ephemeral). Asset compilation should happen during builds. Release phase can be used to upload the compiled assets to a CDN. The following considerations are primarily relevant when creating manual database migration scripts. If you are using an ORM, such as ActiveRecord, these considerations may not apply. Learn more about database best practices. If you perform a database migration, you should always use transactions. A transaction ensures that all migration operations are successful before committing changes to the database. This minimizes the possibility of a failed partial migration during release phase. If a database migration fails during release phase (i.e., the migration command exits with a non-zero status), your new release will not be deployed. If transactions were not used, this can leave your database in a partially migrated state. We suggest using heroku run, rather than release phase, to correct your schema/data. Many actions create a new release, such as a setting a config var or adding a new addon to your app. Your database migration script should check whether a database has already been migrated, before executing a new migration (e.g., does table/column exist, if not add it). This will prevent a new release – such as one created from a new config var – from rerunning your database migration. Heroku releases can run concurrently, which can be a problem if release phase is executing a database migration. Many popular relational databases, such as Postgres and MySQL, offer advisory lock functionality, which can be used to prevent concurrent migrations. Advisory locks are application enforced database locks; when acquired, your tables are not locked for writing, so your application will continue to behave normally. If the lock is successful, Postgres will return t. Now it should be safe to run your migration. If unsuccessful, f is returned and you can fail your migration. It is possible for a release command to fail due to an add-on not being fully provisioned when the command is run; for example, you’re trying to run a db migration, but the db add-on isn’t finished with provisioning. Both Heroku Postgres and Heroku Redis are NOT impacted by this issue.